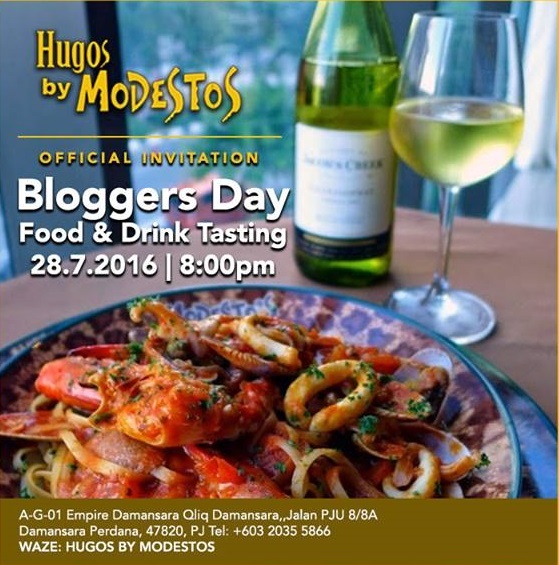 Mommy Jane was invited to join other food bloggers for a Bloggers Day Food & Drink Tasting on 28 July 2016. Since we are allowed to bring 2-3 friends with us to join the review, Mommy Jane had brought eldest Little Angel, CM and hubby there for a dinner together while enjoyed the food served by Hugos by Modesto at Empire Damansara. As all of us knew that Hugos by Modesto had the best local regional and international cuisine with each dish created to satisfy the most discerning palate. Their concept of decor has been created for a sense of space with high ceilings complemented by full height windows which admit natural light during the day and a great view to boot. An ideal venue for that business power lunch that can cater for 200 peoples. At night the restaurant transforms into a more subdued and relaxed environment for those more intimate dining occasions. The myriad of colours in the form of multi-coloured furniture along with striking canvases which adorn the walls in order to create a trendy and modern signature outlet that delivers great flavours in a stylish setting. 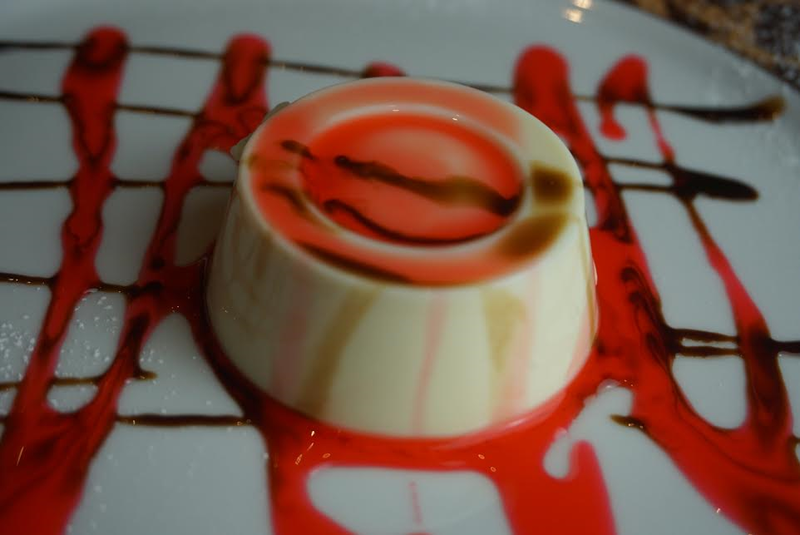 Hugos by Modesto had created one of the most extensive menus with large variety of starters, main courses and desserts. There is something for everyone to suit their palate. Let me introduce to all of you some of the menu served here that we had try out on that day. For a Western Starter, we had Nicoise Salad. It consist of Tuna, Potatoes, Ripened Tomatoes, Hard-Boiled Egg, Kalamata Olives, Red Onion and Crunchy French Beans. A great way to increase our appetite and to stay healthy at the beginning of our course. Calamari Fritti consist of fresh squid, deep fried with Hugos by Modestos Batter. The squid was chrunchy and best to dip with the tartar sauce. A great way for snacking. After introduced you to Western starters, now we go for Malaysian starters. The very famous Malaysian Satay. You can choose either to have Skewered Beef of Chicken that served with peanut sauce, rice cake and onions. The satay chicken was finely marinated and the meat is tender and sweet. Another starter that all Malaysians love is Vegetarian Spring Roll. Best served with their Authentic Thai Chili Sauce. The popiah skin was crunchy and the vegetables were fresh. You can have it as snacks too. We, chinese just love to have soup as one of the course for our meal. Crema Di Funghi was a cream of fresh forrest mushrooms with loads of mushrooms in it. If you're a mushroom lover, you should opt for this delicious soup which is not too thick and not too watery. Just nice to eat it with the garlic bread. For snacks, you could try out their Premier Burger consist of Grilled Beef Patty, lettuce, tomatoes, pickles served on a sesame seed bun accompanied by french fries. Since I didn't eat beef meet, I did not try it out but my friend said it is delicious. For pasta and seafood lovers, Linguine Alla Modesto - Signature might be your choice. The portion is big and best to serve for 2 pax. Linguine in a delightful fresh seafood sauce that mades the pasta taste fresh and full of seafood sweetness. My husband's favourite dish as he enjoyed eating the fresh prawns and crab served. For the Western Mains, you might want to try out their Fish and Chips. Deep fried battered red snapper fillet served with French fries, tartar sauce and lemon wedges. The skin was chrunchy and the meat was fresh. My Little Angel's favourite dish. For me, I always opt for their freshly baked pizzas with homemade pizza sauce. There are 2 types of pizza as above. You could choose to have a pan of Alla Salmone with tomatoes, cheese, smoked salmon and capers or Hawaiana with tomatoes, mozzarella, turkey ham, pineapples and onions. Meal will not complete with some desserts. 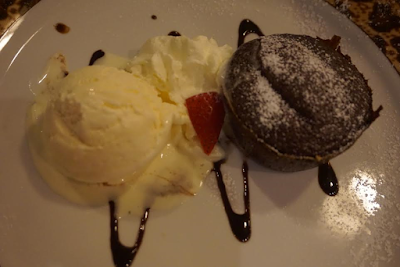 The best that I had is Tortino Al Cioccolato where rich chocolate brownies served with vanilla ice cream. Since the brownies was hot from oven, it was a bit chrunchy and rich with chocolate taste. Located at Unit A-G-01, Ground Floor, Qliq Hotel Empire Damansara, Jalan PJU 8/8, Damansara Perdana, 47820 Petaling Jaya, Selangor Darul Ehsan. For reservation, please call 03-20355866.
Business hours : Mon to Sun from 6.30am - 11.45pm. Thanks to Hugos by Modesto for having us to their food and drink tasting. We love the food that was prepared for us from starter to main course, soup, snacks, side dishes, drink and sweet desserts, every food was yummylicious and fresh. We love the ambience of the environment too that reflect a fine dining experience to all of us. Jac, l love their satay too.. I've just had dinner but your pics have made me hungry again! Sharmini, give it a try and l'm sure you will love it too. Miera, l want to have the brownies on my next visit. Wow~ Every foods look so yummy! I would like to try the pasta. Shini, that one is my favourite too. The prawns were big and fresh. Sharon, you shld. Enjoy it with your family and friends. How's the food? MOdesto's environment is quite nice..
Kylie, l love the food that served to us on that day. Simply delicious. May, you will love it. The pizza and pasta looks so yummy! I think this is such s great hang out location with friends! Everest, it is indeed a great place where you can enjoy live music too. Amelie, date with your bf there and enjoy your food too. The calamari and burgers look soooo gooood! Hanniz, the burger looks cute too. The food there looks delicious, especially those mash potatoes and wedges! So much carbs but heck potatoes is life! Arisa, I love their potatoes too. It taste good.